Cayden Security Vendor Risk Managed Services (VRMS) accomplishes this by offering the technology, process, and people necessary to efficiently understand vendor risk, help you remediate inefficient controls, and better protect your organization from third-party risks. 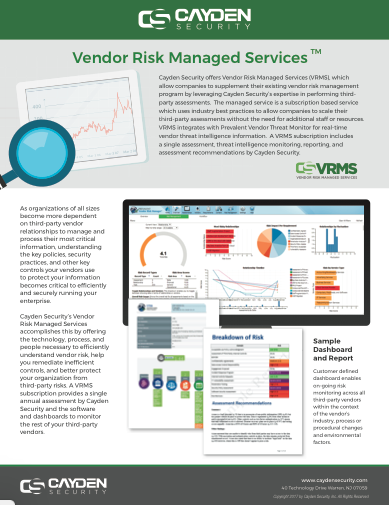 A VRMS subscription provides a single annual assessment by Cayden Security and the software and dashboards to monitor the rest of your third-party vendors. Fill out this form to download the resource, your download will be emailed to the address you provide. Copyright 2019 CAYDEN SECURITY. ALL RIGHTS RESERVED.